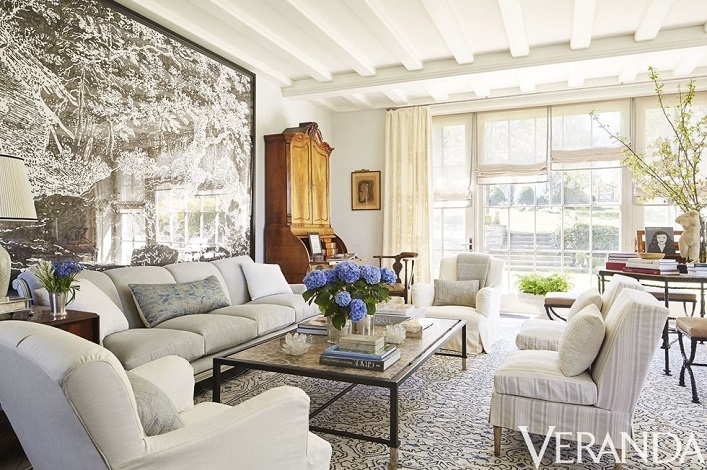 This inviting living room from a charming home in Long Island is designed by Frank De Biasi. Beautifully layered with a sense of openness, this gorgeous room oozes tranquility and relaxation, thanks to the neutral color scheme. The huge artwork behind the sofa provides a major design statement and becomes an instant focal point while grounding the space all at once. The classic secretary desk with hutch top exudes a sense of warmth and provides a great visual balance next to the art. The ceiling slats and subtle patterned rug create just enough visual interest, contributing to a delightful yet airy feeling to the space. Elegant, polished and timeless, there's so much to be inspired by this stunning living room, don't you think? What are your thoughts? Jesse I absolutely love this room!!! I don't like the huge picture behind the sofa. Drowns out the lovely aspects of the room. There should be a transfer of color from the beautiful secretary hutch and drapes, say in pillows, to the sofa and chairs. I don't understand what the artwork is, but I like the size. I love the neutrals.